Pat Peoples is practicing being kind instead of right. He also does thousands of sit-ups on the Stomach Master 6000, jogs many miles, goes to therapy to avoid going back to ‘the bad place’, a neural health facility he believes he has spent 4 months in, and reads great works of American literature. In short: Pat Peoples has embarked on a journey of self-improvement, because Pat Peoples has a theory. That theory is that life is a film created by God and that its “silver lining” will be the end of ‘apart time’ (the reason for which he can’t remember, but he’s convinced Kenny G. has something to do with it) and Pat’s reunion with his wife Nikki. But something is not right. Someone stole all the pictures of Nikki from his parental home (where he lives after leaving the bad place until he can move back together with Nikki), he struggles with the tragic silver-lining-less endings of the works of Hemingway and Sylvia Plath, and he starts to suspect that he has spent years in the bad place instead of mere months. In the meantime his mother is crying all the time, his father won’t even look at him let alone embark in fatherly conversation, and the Philadelphia Eagles keep losing despite Pat religiously wearing his Hank Baskett jersey. And then there’s Tiffany, an odd woman who moved back into her parents’ place after losing her job after her husband’s death. She follows Pat around on his runs, “scouting” him, rarely says a word and when she does they have no filter. She wants something from Pat, but he can’t figure out what that could be. And then he starts getting letters from Nikki. 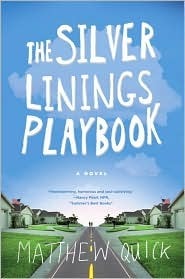 The Silver Linings Playbook is not an epic tale. It’s a bittersweet story about people and relationships. About friends and family and connections. A story about many kinds of love and the refusal to be defeated by mental health issues and pessimism and Kenny G, delicately balancing between laugh out loud funny and heartbreakingly grave. An interesting facet to the book I found was the breach of the fourth wall. The bad place is where he started writing down his memoirs, because his memories started slipping and at times he talks directly at the reader, sometimes to explain something other times to ask the reader to participate. (I totally channelled my inner Rocky to the beat of “Gonna Fly Now” when he requested it.) This way of writing penetrates the boundaries normally present in fiction same way Pat People’s actions and thoughts penetrate boundaries normally set up between adults. I could go on about the parallels between the works of literature Pat read, the writing style and his mental condition, but in the end somehow the important thing is that this book made me laugh out loud and squeezed my heart and made me wail along with 80s power ballads, and it taught me an important lesson: that sometimes the only way to hold on is to let go. This entry was posted in Guest Review, What We're Reading and tagged book review, discover new books, finding inspiration, guest review, matthew quick, reading, the silver linings playbook.